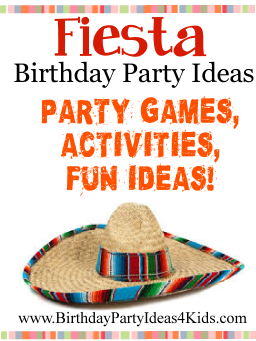 Fun ideas for a Mexican Fiesta party! Great for kids, tweens and teenage birthday parties and Cinco De Mayo celebrations! Cut out fun shapes such as cactus, Mexican sombreros or chili peppers and paste on the front of note cards. Write party information inside. Make or buy small Mexican Flags. On blank index cards or small note cards write party information and then attach to the flags. Embellish the flags by tying long pieces of green, red and white ribbon to the flags. Buy plastic maracas and write party information on the maraca with a permanent black marker. Leading into the party area make (or buy) Mexican flags and place them in the ground leading from the street to the entrance of the party. Decorate the party table with solid red table cloths, green plates, cups and napkins and white or yellow flatware. Use small Mexican blankets for placemats and a runner for the table. Use new sombrero hats or Mexican pottery to hold snack foods on the party table. Make or buy a Piñata and fill it with candy and small toys. For complete directions and safety for having a piñata at the party see our Piñata page. See our Paper Mache craft page on how to make your own pinata using items you have around the house. Play fast paced music and let the kids jump around like jumping beans. When the music stops they have to freeze. Then start the music again and so on. Place a large sombrero on the floor and have party guests gather around it and make a big circle. Have them stretch out and hold hands. Play fast paced Mexican music and have the children start dancing clockwise around the hat. Call out the name of a party guest and that child leaves the large circle and gets to dance around the sombrero going counter clockwise while the rest of the children are still dancing clockwise. After 15 - 20 seconds call out another child's name. That child takes the place of the inside dancer and the first dancer takes their place back in the large circle. Continue until everyone has had several turns. Buy a blow up cactus or make one out of a large cardboard box. Cut rings out of cardboard big enough to fit over the arms of the cactus. Line up party guests and have them try to throw the rings onto the arms of the cactus. of tape on the back Burro tails. Blindfold children, spin them around, and point them toward the poster. The child who pins their burro tail closest to the designated spot, is the winner! 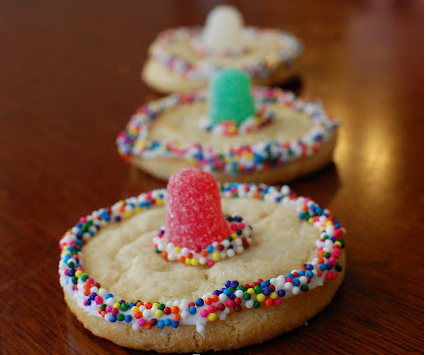 Sombrero Cookies - Make a quick and easy sombrero cookie by piping white frosting around the edges of a sugar cookie and in the center to hold the gumdrop. Place a large gumdrop in the center of the cookie and then add colorful sprinkles to the frosting.